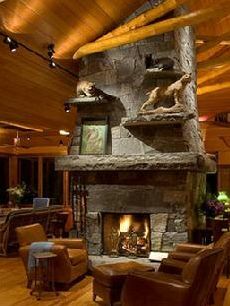 Stone Fireplace Design Ideas . . . Take It To The Top! 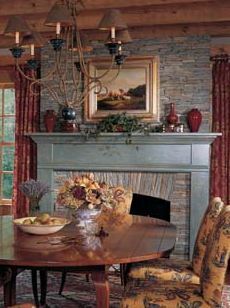 The stone fireplace design ideas presented here feature a collection of striking -- even monumental -- floor-to-ceiling stone surrounds. 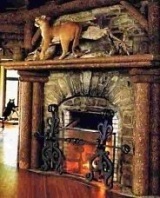 However, each of the fireplace surrounds is truly unique and distinctive . . . . . and deliberately designed to stand apart from the crowd! The cut stone corner fireplace design that follows is beautifully crafted and features a "layered" look consisting of a series of alternating pilasters and recesses. A raised hearth provides storage for firewood below. Above the firebox opening, a gently curved arch is framed by large wedge-shaped stones, or voussoirs. 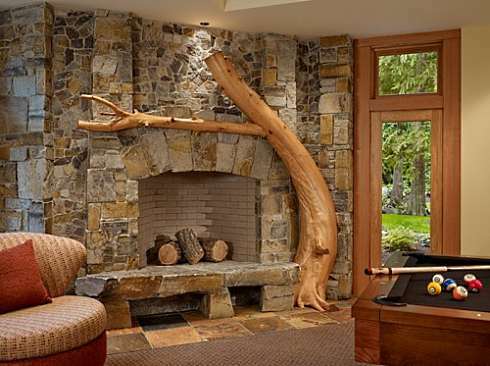 But the real focal point of this design is the naturally formed, hand-peeled tree trunk that appears to grow out of the floor to the right of the firebox opening, and then branches out above the opening to form a mantel shelf! 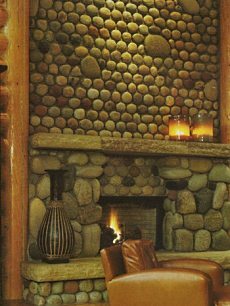 The two stone fireplace design ideas that follow also incorporate wood in their designs -- albeit in a more finished state -- to break up the stone massing and lend visual interest. Both traditional in style, the design pictured below, left, is from Hedberg Aggregates in Minnesota, while the design pictured below, right, is from Eastern Adirondack Home and Design, based in Bolton Landing, New York. rison Design Associates. 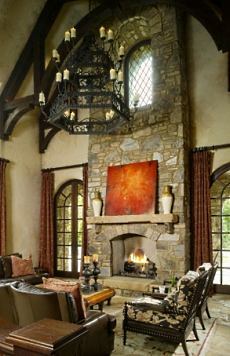 A richly finished wood mantel frames the firebox opening, while a majestic stone arch is worked into the stonework above the mantel shelf to "frame" the large framed painting hanging on the wall. 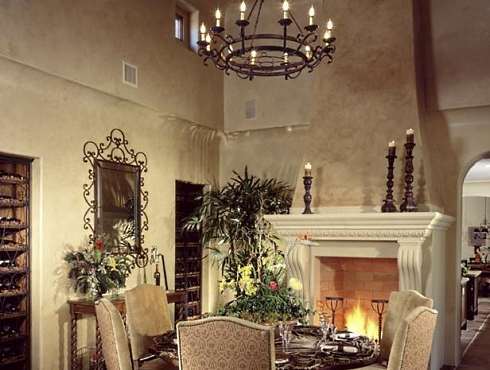 The towering fireplace pictured below, right, anchors the great room of a home in Colorado. Precisely cut and positioned sections of stone surround the arched firebox opening. In stark contrast to the smoothly finished firebox surround, the rest of the stonework is roughly textured and laid in a random mosaic pattern. A simple wood mantel shelf aids in the transition from smooth surround to a wall of textured stone massing above. 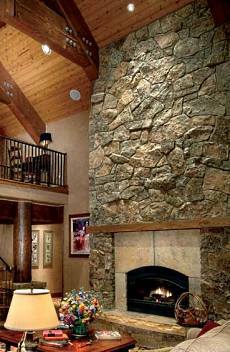 If the stone fireplace design ideas you have in mind call for more of a rustic look, one or both of the designs that follow may be better suited for you. 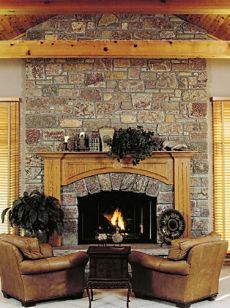 The unusual river stone or river rock fireplace pictured below, left, derives its unique distinction from the symmetrical placement of horizontal rows of similarly- sized stones above the mantel shelf, occasionally interspersed with a larger stone for added visual interest. Below, right, is a stone fireplace design from Andrew Chary Architects, based in the Adirondack region of Upstate New York. Crafted from blocks of granite and a huge lintel to support the tremendous weight above the firebox opening, it features a massive chiseled mantel shelf and a series of "outcroppings" in the form of smaller stone shelves above it to display wild game. The very unique and modern looking stone fireplace surround pictured at right and below is actually more than 60 years old! 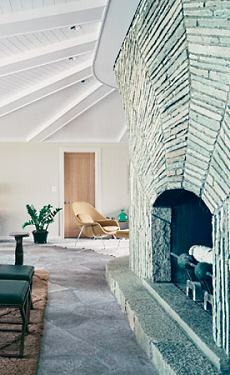 Anchoring the living room of a stone cottage along Lake Michigan, the fireplace -- as well as the cottage, itself -- was created in the 1940s by Earl Young, a highly innovative designer and builder whose career spanned several decades during the middle of the 20th century. 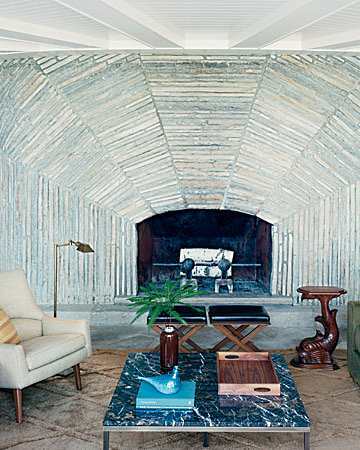 The unusual fireplace design shown here features a geometric pattern of thin strips of stone that radiates upward and outward from the arched firebox opening. The two stone fireplace design ideas that follow come from Harrison Design Associates, one of the premier architectural design firms in the United States today. The monumental design pictured at right features a beautiful diamond-paned leaded glass window set within a deep recess of stonework near the ceiling peak. Echoing the arched firebox opening, the window design is carried through to the arched pair of French doors flanking each side of the fireplace surround. 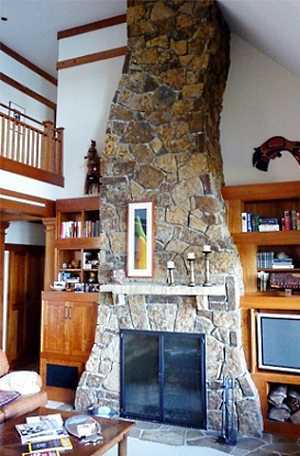 An entirely different -- but equally striking -- approach to fireplace design is pictured below. 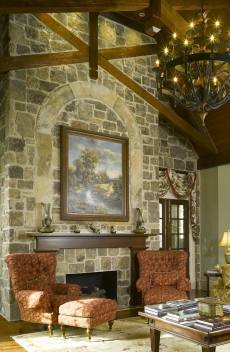 A traditionally styled smooth stone fireplace mantel is set against a backdrop of layered, roughly textured stonework that extends from floor to ceiling. 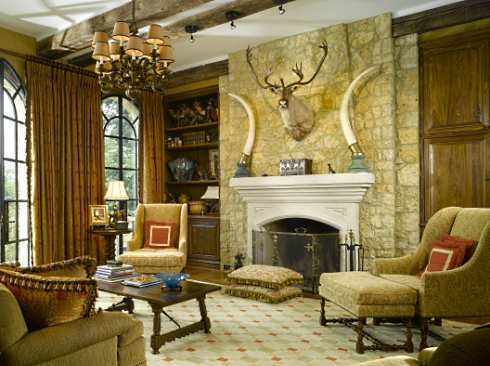 A mounted wild game head and pair of elephant tusks add drama to the overall composition. And finally, if the weight or cost of a floor-to-ceiling stone surround is a limiting factor -- or if you prefer to "mix it up" -- please click here for fireplace ideas that feature a multitude of creative ways to combine other materials with your stone surround to create a floor-to-ceiling design with a distinctive and commanding presence! Please check back often or subscribe to our RSS feed, as we fre- quently add new stone fireplace design ideas to our site. To Personalize Your Fire Space!